Campfires are allowed in organized campgrounds. Campfire Permits are required annually and are good for the year they are issued. Campfire Permits are required on all Federal Lands within the Ebbetts Pass area. Campfire Permits are also required on private lands and must accompany a written letter of permission from the land owner. Campfire Permits are available at EPFD Stations 1 and 3, USFS Stations and offices and CAL FIRE Stations. As Californians make their summer vacation plans, CAL FIRE and federal fire agencies want to ensure vacationers obtain necessary campfire permits and learn how to have a campfire safely. The California Wildfire Coordination Group (CWCG) unveiled the new fire prevention website, www.PreventWildfireCA.org, which for the first time offers an online campfire permit section. EPFD, USFS & CAL FIRE personnel, wish to remind campers to be extremely careful with your campfires. It’s just good practice. FOLLOW THESE FIRE SAFE REGULATIONS ! Keep your campfires small in diameter. Clear at least 5 feet to bare dirt in all directions around your campfire. Stay in attendance at all times with a shovel, rake or other fire tool. Upon completion of the campfire, apply enough water to assure fire is dead out, dig and stir the ashes and douse with water again. Follow all regulations and restrictions. Stop and ask for current campfire status and restrictions on each outing. Note: in some areas digging pits are not allowed because of archaeological or other concerns. Find out the rules in your area please. 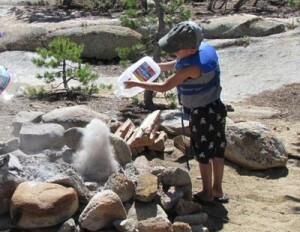 Dig A Pit – Before you start your campfire, you need to prepare and arrange an appropriate pit. Whether building a campfire pit yourself, or preparing a pit that you found on your campsite, there are some safety tips you should follow. Choose a spot that’s downwind protected from wind gusts, and at least 15 feet from your tent and gear. Clear a 10-foot diameter area around the site. Remove any grass, twigs, leaves and firewood. Also make sure there aren’t any tree limbs or flammable objects hanging overhead. Dig a pit in the dirt, about a foot deep. Circle the pit with rocks. Your campfire pit is built and ready for preparation! Preparing Your Campfire Pit: Before you start your campfire, you need to prepare your pit. Fill the pit with small pieces of dry wood; never rip or cut branches from living trees. How to Build a Campfire – If you find a good pit at your campsite, it’s time to safely build your campfire. Now that you have prepared your pit, it’s time to build your campfire. Follow these steps to have a safe and fun time. Tinder (small twigs, dry leaves or grass, dry needles). Kindling (sticks smaller than 1″ around). Fuel (larger pieces of wood). Loosely pile a few handfuls of tinder in the center of the fire ring/pit. Lay the kindling over the tinder like you’re building a tent. Cross (Perfect for a long-lasting campfire). Crisscross the kindling over the tinder. Drive a long piece of kindling into the ground at an angle over the tinder. Lean smaller pieces of kindling against the longer piece. Log Cabin (Longest lasting campfire). Surround your pile of tinder with kindling, stacking pieces at right angles. Top the “cabin” with the smallest kindling. Ignite the tinder with a match or lighter. Wait until the match is cold, and discard it in the fire. Add more tinder as the fire grows. Blow lightly at the base of the fire. Add kindling and firewood to keep the fire going. Keep the fire small and under control. Safety doesn’t end when the fire’s lit. – A roaring fire is both a success, and a responsibility. It is your job to properly maintain and extinguish your campfire so that future campers can do the same. Keep your fire to a manageable size. Make sure children and pets are supervised when near the fire. Evan is a very good camper and demonstrates responsible campfire safety. Pour lots of water on the fire, drown ALL embers, not just the red ones. Never burn aerosol cans or pressurized containers. They may explode. Never put glass in the fire pit. Glass does not melt away, it only heats up and shatters. Broken slivers of glass are dangerous. Aluminum cans do not burn. In fact, the aluminum only breaks down into smaller pieces. Inhaling aluminum dust can be harmful to your lungs. Pack it in, Pack it out. – Be sure to pack out your trash. It is your responsibility to pack out everything that you packed in.